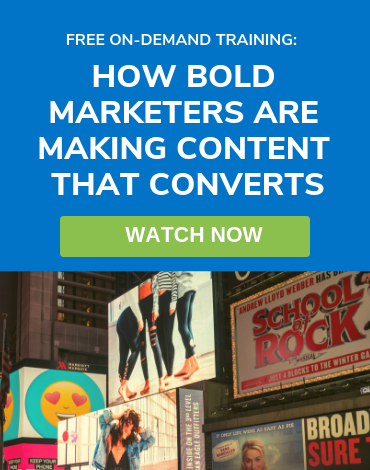 Getting Agile to scale is tricky in any context, and scaled Agile marketing is no different. Recently, however, one of the co-creators of Scrum, Jeff Sutherland, has released a new meta-framework called Scrum@Scale. For my money, this is far and away the most applicable model for marketing organizations. 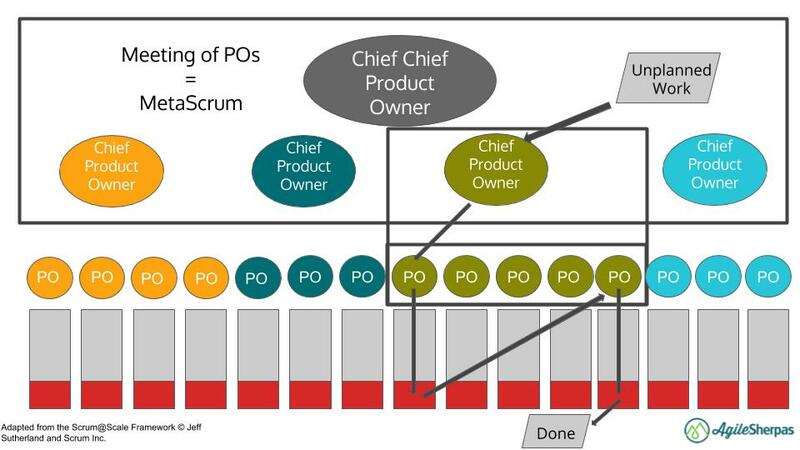 As with most Agile things, we’re going to need to do some adjusting to language and concepts, but much of Scrum@Scale can be enormously useful for large marketing departments. Here we’re going to be dealing primarily with the final step, scaling intelligently, but there’s a considerable amount of homework to be done before you can get to this. Build an Agile Mindset: You need a firm foundation on which to build your new organization, so this step is crucial. Everyone in marketing needs to understand Agile as a concept so they can support the group’s transition. Ideally this step also includes grounding in other concepts that compliment Agile, such as Design Thinking and Theory of Constraints. Test and Evolve Practices: Only once you understand the mindset can you begin to apply it by establishing actual practices, like backlog refinement and daily standup. Knowing the “why” behind meetings and roles allows you to pick and choose wisely and avoids costly mistakes. Draft a Scaling Plan: Whether you’re working with a group of 20 or 2,000, you need a roadmap to guide your scaling effort. The framework here (based on Jeff Sutherland’s Scrum@Scale) is designed to be modular, so you can drop in new groups steadily over time. This tends to be less risky and more effective than transitioning hundreds of people simultaneously. Scale Intelligently: Begin to implement your plan, following the Agile principles of inspect and adapt. 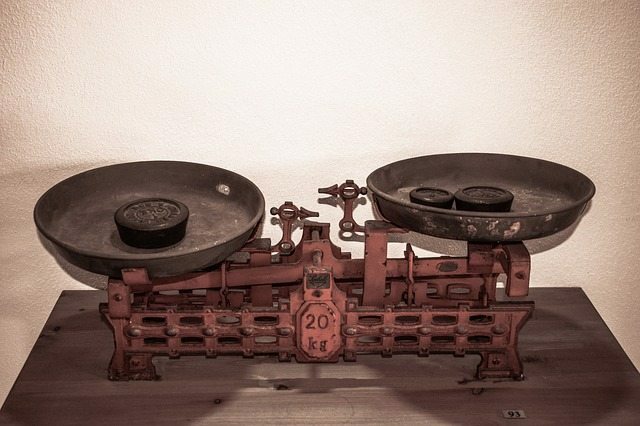 Monitor your agreed-upon metrics to adjust the plan as you learn more about how Agile really works inside your marketing organization. 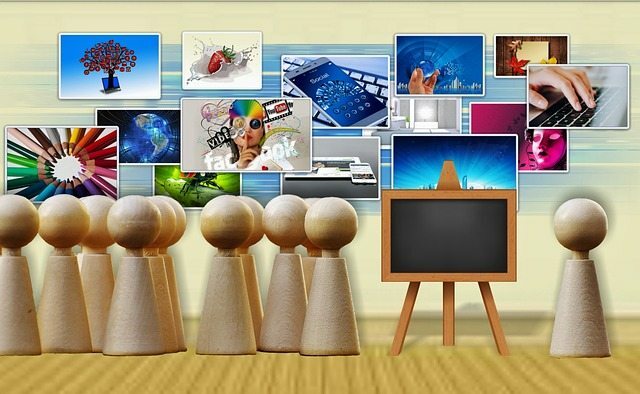 Stable marketing teams will be the building blocks of scaled Agile marketing, so it’s important to set them up properly. For the love of all that is good and decent, do NOT try to structure them around short-term projects. And do NOT stick with your existing silos and expect Agile to work. What you DO need to do is keep them small. Three to nine members is a good range, with 4-5 being the sweet spot. These numbers typically don’t include supporting team members, who we’re calling the Agile Lead (AL) and Marketing Owner (MO). The MO acts as the go-between for the team and the rest of the organization. (For more on this crucial role, see this article.) They own the team’s backlog, and ensure that its contents align with the business goals of the organization. The Agile Lead (also known as the Scrum Master) keeps Agile working on the team, removing impediments and supporting team members in using Agile to manage their work. In true Scrum@Scale, this person makes sure everyone is doing “true” Scrum; our concern in marketing is less about getting a methodology right, and more about staying true to the Agile mindset. As scaling takes hold, this person also escalates problems up the chain, joining larger groups in a Scaled Daily Standup meeting to share impediments and solutions with other teams. Agile marketing is a long-term project, and you probably won’t ever be really “done” evolving it. 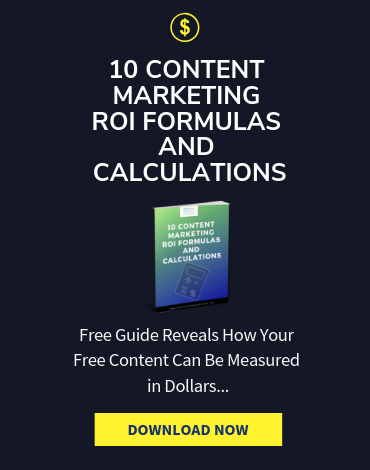 But before you embark on a serious attempt at scaled Agile marketing, make sure you have fairly high functioning Agile marketing teams in place. Small problems in teams will be compounded at scale, so make sure you’ve allowed time for these issues to surface and be resolved. This is why pilots are so crucial; they allow smaller groups within a marketing organization to test the waters and identify the unique roadblocks for using Agile in your company. 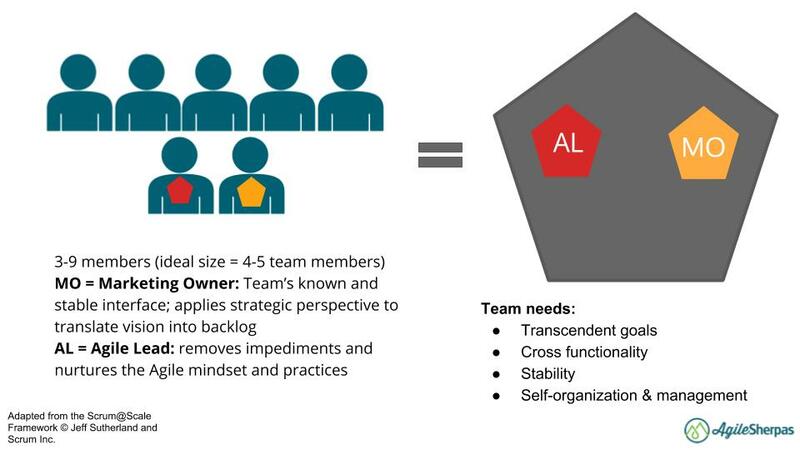 The lessons from pilot teams should be used to create a reference model for future teams. Reference models aren’t precise blueprints (each team will have their own special spin on Agile), but rather a set of good practices that new teams can follow to set themselves up for success. 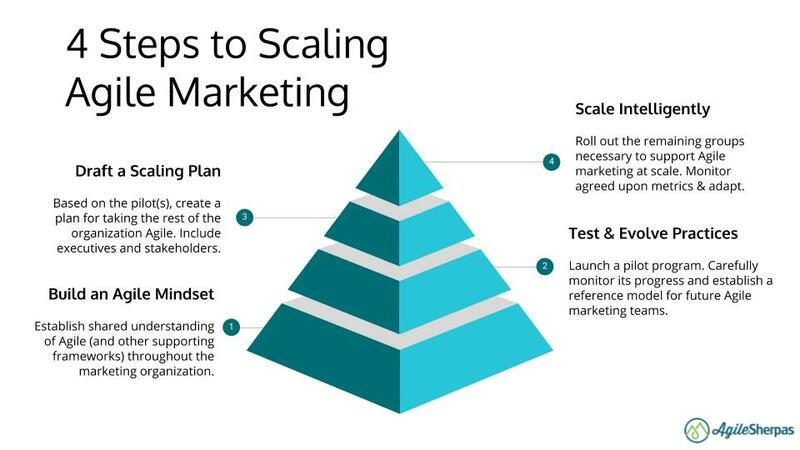 Now that we’ve covered the basics, let’s explore what scaling really looks like for Agile marketers. On the left we have the Agile Lead cycle, and on the right the Marketing Owner cycle. The left side governs HOW work actually gets done, while the right establishes WHAT work should be prioritized by the teams. This is a fairly self-explanatory diagram, but let’s establish what each piece means before we look at organization designs based on it. This part works like most Agile groups: teams work in short iterations, pull work from a prioritized backlog, deliver work frequently to customers, collect their feedback, and adapt their output and process accordingly. The big differences in the scaled model are that we need cross-team communication and the removal of bigger impediments. 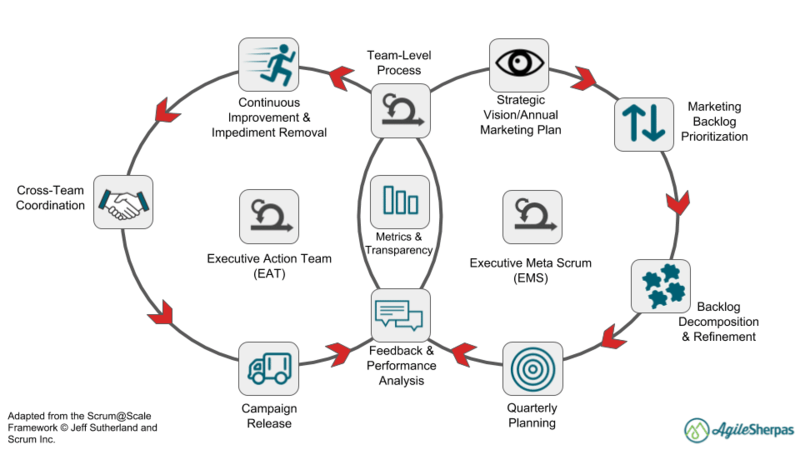 This requires the Agile Leads from various teams to get together regularly in a Scaled Daily Standup (labeled as SDS in some of these diagrams). What impediments does my team have that will prevent them from accomplishing their Sprint Goal? Is my team doing anything that will prevent another team from accomplishing their Sprint Goal? Have we discovered any new dependencies or a way to mitigate them? Effective coordination among teams also requires the addition of a new group: the Executive Action Team (EAT). 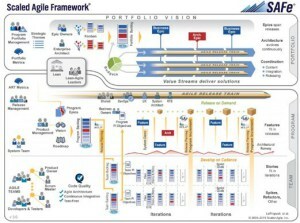 In short, this group is responsible for the success of Agile transformation inside the larger marketing function. They build a transformation backlog and shepherd its contents through to completion. Any impediments that come up at an SDS that can’t be resolved by the collected Agile Leads will be escalated to the EAT by the Head Agile Lead, and they come up with a way to get it taken care of. On the right we see the Marketing Owner Cycle, which governs what all the teams in an Agile marketing department will be working on. They’re responsible for coming up with a large strategic vision, typically represented as an annual marketing plan, prioritizing the components of that vision, and then breaking it down into large initiatives that can be taken up by the various Agile marketing teams inside the department. The strategic vision may be analogous to an annual marketing plan, but don’t imagine that this cycle occurs only once a year. Quite the opposite. Like a regular Agile team, the collections of MOs who are part of this half of the cycle connect frequently. They reexamine the vision, initiatives, and priorities to ensure they’re still the best use of the team’s time, and communicate any changes very clearly. It’s these frequent meetings that allow teams to respond in nearly real time to audience feedback, competitor movements, or emerging opportunities. Note how work flows from the EMS to individual teams, where their MOs add work into their team’s backlog (the red indicates a buffer that’s left empty to accommodate incoming work). Individual MOs can negotiate with one another to ensure the right team takes on new work. While Meta Scrums and Executive Meta Scrums are made up mostly of MOs and executives, they are open to anyone. What’s more, individual contributors are often valuable attendees who can provide insight into effort levels and other logistics around completing potential initiatives. There’s a lot more that could be said about these cycles and their components, but we’ll save that for another time. For now, let’s get down to the really fun part: designing Agile marketing departments based on these ideas. Because everyone is working together on a single product line, they all get together in a single Scaled Daily Standup and their backlogs are governed by a single Meta Scrum. Likewise one EAT and one EMS are responsible for removing large impediments and setting marketing strategy, respectively. 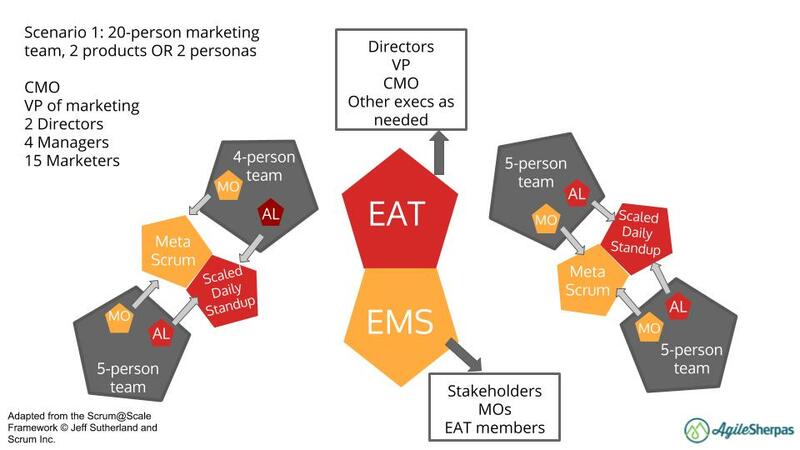 For this group, and for most scaled Agile marketing departments, the EAT is made up of Directors, VPs, the CMO, and any other executives whose input could be useful in dealing with bigger impediments. 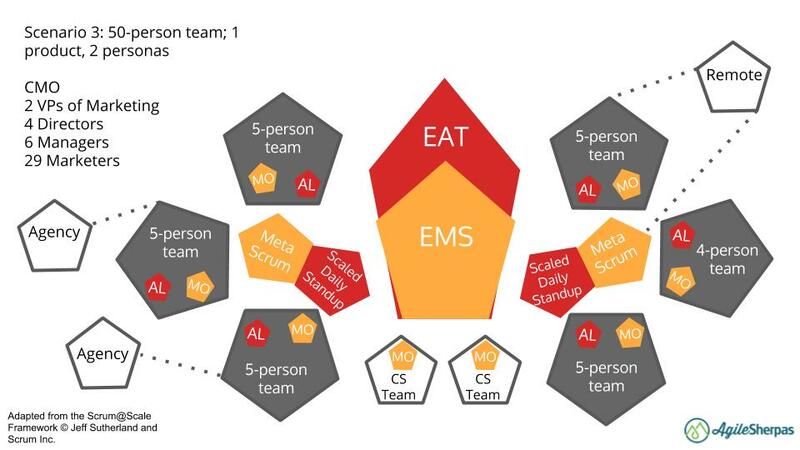 The EMS has a similar composition, but it also includes MOs from the individual teams if they are senior enough to be involved in strategic discussions. 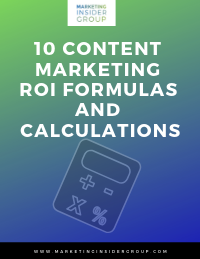 It can also be useful to have representation from sales, finance, and other groups who impact/are impacted by marketing on this team. In this case there are separate Scaled Daily Standups and Meta Scrums for each product/persona. This is because only teams who need to collaborate in order to deliver should be joined through these meta-teams. Teams working on Product 1 aren’t impacted by the work of teams working on Product 2, so there’s no need to get them communicating daily. There remains, however, a single EAT and EMS to govern the work of both products. This ensures a consistent experience across products/brands, as well as the distribution of learnings across teams from different products. If you’re well outside the twenty-person threshold, never fear. This structure expands out very nicely. 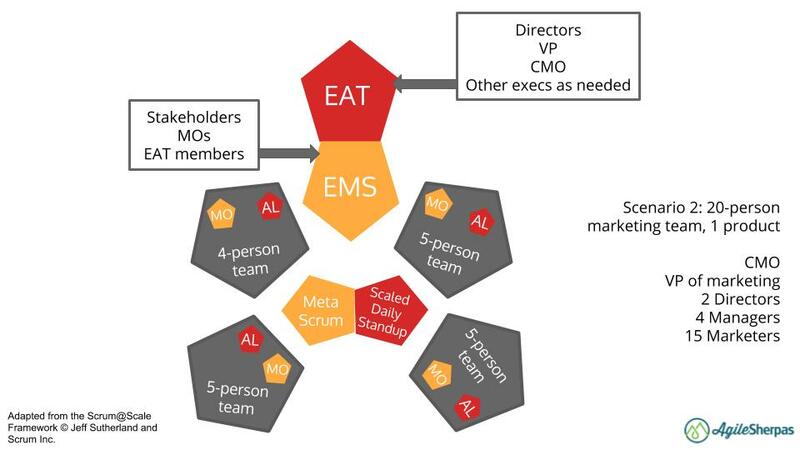 The first change is that the EAT and EMS are made up of the same people, so we’ve diagrammed these as overlapping groups. Second, we now have two Creative Services (CS) teams in the mix (shown as white pentagons). Individuals from these teams actually sit on the Agile marketing teams in gray, but they also have their own MO who helps ensure they’re doing the right work at the right time. Since this MO will be part of the Meta Scrum meetings, they can move CS team members around on a daily basis if needed. 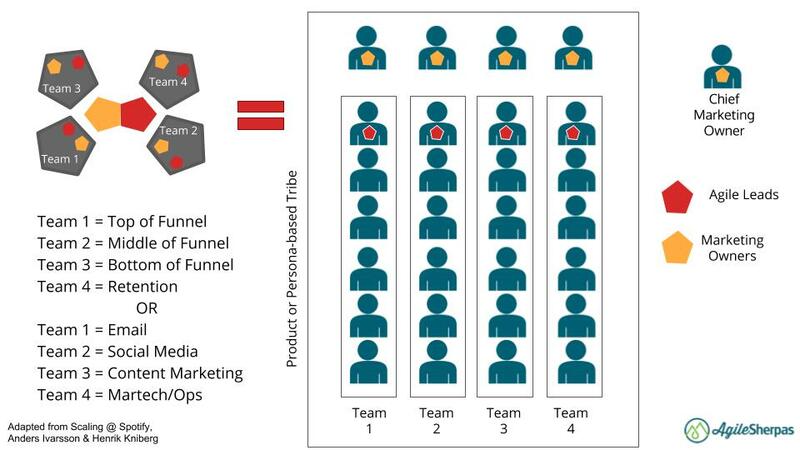 This arrangement helps accommodate highly specialized teams/people who would not be used 100% of the time if they sat on a single Agile marketing team. The agencies act as an extension of the teams who are working with them. So the ALs from those teams will share agency input at the Scaled Daily Standup meeting, as well as during the team’s own individual Daily Standup. 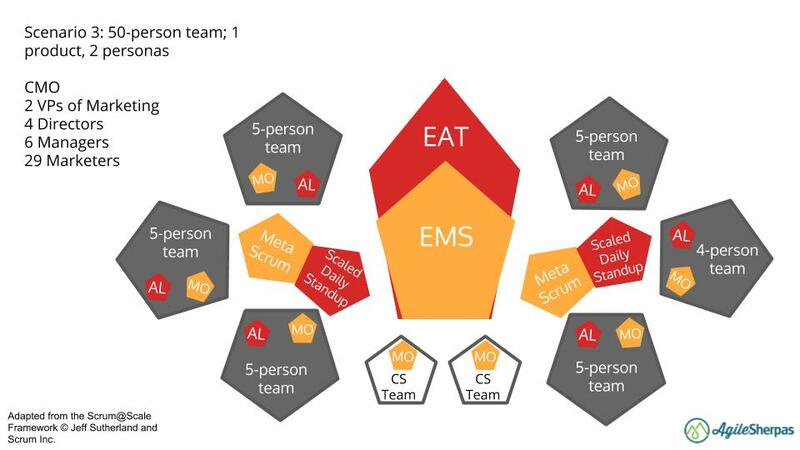 The MOs for the teams responsible for agency work likewise act as the liaison between the agency and the strategic perspective provided by the Meta Scrum and EMS. The remote team works a little differently. If they’re large enough, they may have their own MO who joins in a Meta Scrum to connect the team to the strategic perspective this group provides. When it comes to process, however, the AL from a non-remote team helps them optimize and acts as their representative during Scaled Daily Standup. They join one of the non-Agile teams for Daily Standup to keep them connected to what’s going on at the office. Once again we have a collection of specialized resources in white pentagons. These are represented as creatives services teams, but they could really be any group with unique skills that can’t be utilized fully on a single Agile marketing team. Note that each specialized group has its own MO who’s responsible for ensuring the team members are doing the right work on the right team at the right time. They do not, however, have their own AL; their perspective on process will be incorporated during retrospectives with the teams they’ve recently joined. 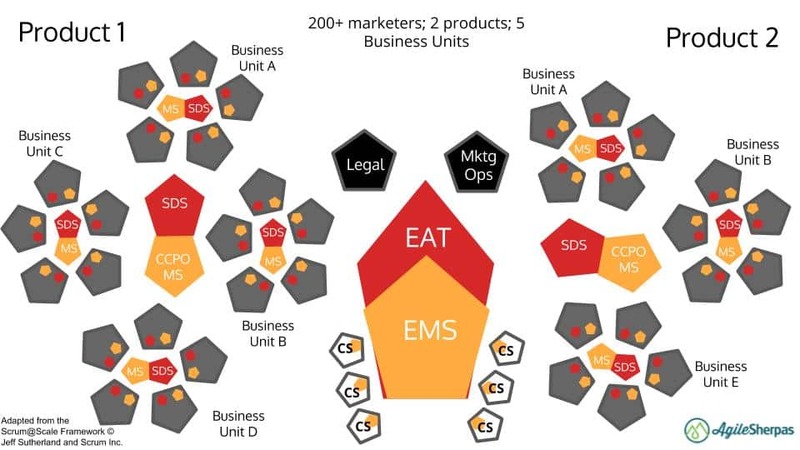 The final important thing to note in this diagram is that teams are grouped according to the business unit they serve. Only teams who need to collaborate in order to deliver need to form groups (sometimes known as Tribes). Speaking of Tribes, let’s end by taking a closer look at one of this modules from the above diagram. These four teams have a shared purpose — persona, product, or business unit — and thus need to have a shared vision and backlog. Their grouping is known as a Tribe in the Spotify model, but the naming doesn’t really matter. The important thing is that the teams are organized in such a way as to be able to deliver value independently and cross functionally. That typically happens best when teams are organized by stages of the customer journey, but you might be able to arrange them according to channel and still see good value coming from each team. More holistically, the Chief Marketing Owner who oversees this Tribe ensures that they’re pulling towards the same goal, doing high quality work, and most importantly balancing the needs of the customer with the demands of the business. Despite the common usage of the phrase, “Agile transformation,” there is no magic wand that you can wave and become Agile overnight. Scaling takes time, effort, and above all commitment from all levels of the organization. 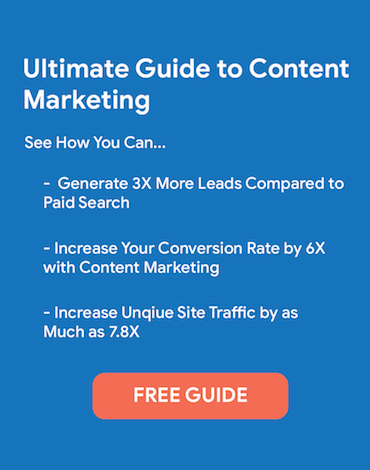 You can map out a scaling strategy, but be prepared to evolve it as teams go through the process and learn more about how Agile marketing really works in your unique situation. 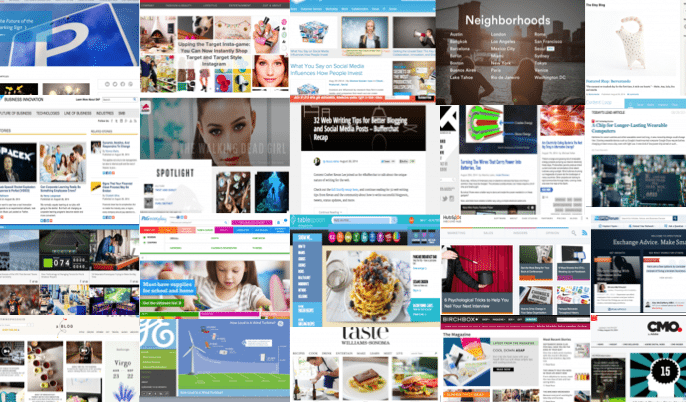 The post Scaled Agile Marketing appeared first on AgileSherpas.